Looking for a place to watch the 2019 Rugby World Cup in style? BELUSHI’S BARS HAVE YOU COVERED! Support your country and watch every game as the best Rugby nations compete to win the William Webb Ellis Cup. From the 20th of September until the 2nd of November get along to the Home of International Sports across UK and Europe as we show the action LIVE on huge HD screens and projectors. Serving up badass burgers, epic snacks, internationals beers and a huge range of spirits, Belushi’s Bars are the only place to watch all the 2019 Rugby World Cup! Book your front row seat for a guaranteed premium experience and celebrate every win with us! **Please note that these packages are for the qualifying rounds only. If you would like to book for; The Quarter Finals, The Semi Finals or Finals, please contact us at party@belushis.com for more details. Pancake + Coffee followed by choice of main course + drink (soft or beer). "Great service, great atmosphere , if you want to watch a live sporting event this the place to do it. Not only was there many big HD TVs set up all around the bar they also had 2 projection screens so no matter where you were in the bar you always had a view of the game." Get the VIP experience for Rugby World Cup 2019 in our dedicated private VIP areas, just like being at the stadium! 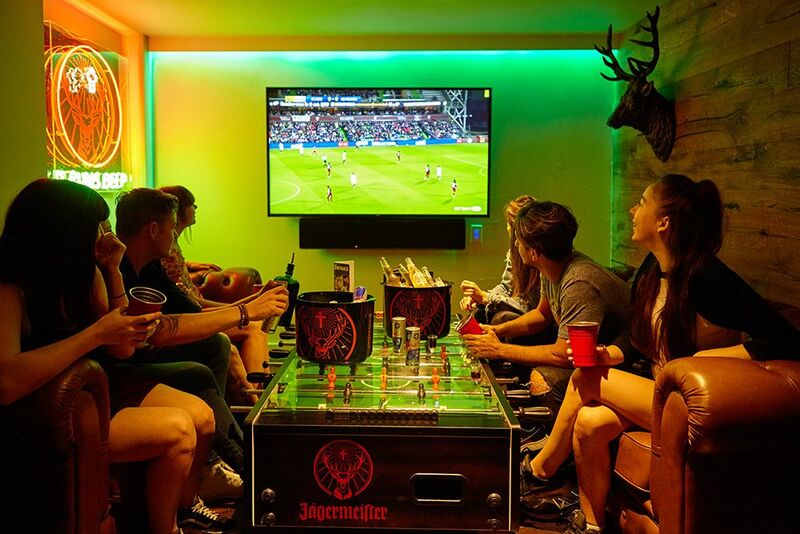 Our VIP areas are privatised, fully equipped with a your own TV and live commentary. You and your friends will be ready for the action with awesome food, loads of drinks and dedicated teams so you don't miss a moment! With the Rugby World Cup just around the corner, we’ve decided to launch our own mini blog series on Belushis.com. We’re going to be previewing the teams, coaches and players who’ll be competing to win the William Webb Ellis Cup. We’ll also be bringing up much much more than that, to keep you up to date with everything about this year’s RWC.